You are currently browsing the tag archive for the ‘puns’ tag. Mickey applies for a job at Tony’s pet store. Then Minnie drops by and together they perform their usual song-and-dance-routine. ‘The Pet Store’ was Mickey’s last cartoon to feature the half song-and-dance routine half story formula, a story structure that by 1933 had become old-fashioned. This time Minnie’s quite tiresome lalala’s are interrupted by ‘Beppo, the movie monk’, an ape who has read about King Kong (that movie was released the same year) and who wants to imitate him, after he had imitated Stan Laurel. 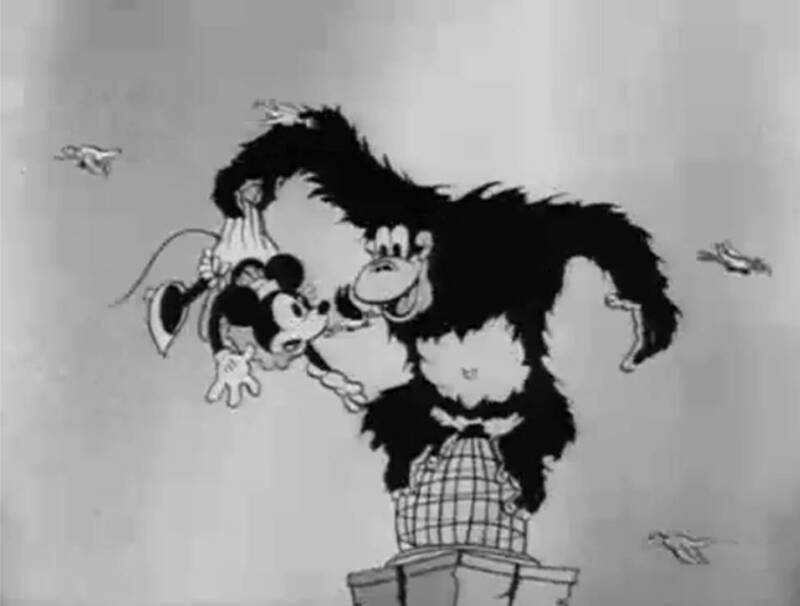 This leads to a nice spoof of King Kong, in which the ape climbs a pile of boxes with Minnie under his arm while being attacked by birds, mimicking the planes in the original feature. In the end Mickey and Minnie are fleeing the pet shop, just before the owner returns, leaving it in complete ruin. Unfortunately, by 1933 such battle scenes had become as jaded as the song-and-dance routines, and the one in ‘The Pet Store’ is not really different from the ones in ‘The Bird Store‘, ‘King Neptune‘, or ‘Babes in the Woods‘ (all 1932). Nevertheless, the take on ‘King Kong’ is marvelous, and more original than Walter Lantz’s much more literal spoof ‘King Klunk‘ from one month earlier. Tony is the first elaborate human to enter Mickey’s world, being on par with the human characters in the Silly Symphony ‘The Pied Piper‘ from one month earlier. He would be topped, however, by the giant in Mickey’s next cartoon, ‘Giantland‘. Part of the fun in this cartoon is provided by Tony’s pseudo-Italian labels (like “birda seed” and “biga da sale”), a type of pun that was later borrowed extensively by Chuck Jones in his Pepe le Pew-cartoons.